The aptly named Costa Verde or Green Coast is one of northern Spain’s greatest secrets – a succession of attractive sandy coves and dramatic cliffs, punctuated by deep estuaries and numerous fishing villages. Among our favorites is Cudillero, a delightful destination full of outdoor cafes and excellent seafood restaurants, which crowd the picturesque plaza beside the port. Behind, cottages painted in a rainbow of pastel colors are scattered over the steep hillside – truly, this is the antithesis of an over-developed, tacky Spanish resort. Cudillero is situated in the Spanish region of Asturias, which was originally inhabited by Neanderthal man, before local Celtic tribes, known as the Astures, exerted their cultural influence over the region we today know as Asturias. They kept control of the area until the Romans invaded in 29 BC, led by the First Roman Emperor Augustus. However, although the Romans controlled much of the Spanish Peninsula, the forbidding terrain of Asturias presented a much greater challenge, and the Roman cultural influence on this part of Spain was negligible. After the collapse of the Roman Empire in the 5th century, Asturias would remain out of reach for both the Visigoth tribes, who established a capital in Toledo in the 6th century AD, and subsequently the Moors from North Africa. Indeed, Asturias is very proud that it resisted invasion by the Moors – the reconquest of Spain is said to have begun in 718 when a Moorish force was defeated by Christians at Covadonga in the Picos de Europa. Subsequently, in 722, a de facto independent kingdom was established in Asturias, called the Regnum Asturoum. According to this historian Agustín Bravo, Cudillero’s first inhabitants were fishermen from other ports of the Cantabrian coast, or perhaps people who had escaped the Normans, who settled on this part of the coast due to its east entry and shelter from the more extreme weather of the Atlantic. Over time, and particularly in the 15th century, Cudillero became a major fishing center in Asturias and intrepid fishermen would sail to Scotland and Belgium in search of the perfect catch. Later, during the Spanish conquest of The New World, many sailors from Asturias would play a vital role in the conquest of the Americas, and Cudillero’s reputation spread throughout the Spanish Empire. The 18th century heralded a golden era for the people of Asturias; during the ‘Age of Enlightenment,’ Asturias was one of the great centers of learning and produced several notable thinkers and reformers during the period. Sadly, the tragic events of the Spanish Civil War would affect the lives of many of Cudillero’s citizens, and indeed the lives of everyone in Spain. The conflict between the military dictator Franco and the Republican government occurred between 1937 and 1939; both sides committed terrible atrocities, including the murder of 7000 priests, monks, and nuns. Franco declared himself the victor in 1939 and remained in power until his death in 1975. He kept Spain out of both World Wars, but under his dictatorship personal freedom was severely restricted – divorce was made illegal and church weddings were compulsory. Asturias, however, was very much on the side of the Republic. A few months before the insurrection began, the extreme right had been responsible for the shooting of the leader of Republican Left of Cudillero, Bonifacio Lopez. Therefore tensions were already high and for a time, the Republicans controlled Oviedo. Unfortunately, Asturias fell to the Nationalists during the battle of El Mazuco in 1937. Many citizens fled to neighboring France during the conflict to escape reprisals from the Nationalist forces, draining the region of its workforce and lifeblood. After Franco’s death, Spain made a remarkably easy transition to democracy and Asturias was granted a much-deserved autonomous status in 1981. The village quickly recovered from the Franco years and in 1984, the village completed the construction of a new port. Peace and prosperity were returning to this special corner of northern Spain. Today, Cudillero remains one of Spain’s most charming seaside villages, imbued with both a remarkable scenic beauty and a lively historic center, which comes alive in the summer months. 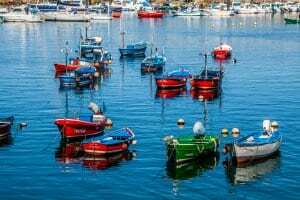 Yet despite the number of visitors from neighboring regions, Cudillero never feels over-crowded, and a welcoming, relaxed vibe permeates this must-visit part of the majestic Costa Verde. Asturians, like their neighbors in the Basque Country, claim to have a formidable gastronomic heritage, and who are we to argue? Certainly, when seafood comes into the equation, Asturias has few equals and the region is justly renowned for the variety and freshness of the abundant fish and shellfish from the Atlantic. Meanwhile, vast mountain ranges mean plentiful game, hams, lamb and cured meats, which are often combined with beans to form hearty stews. 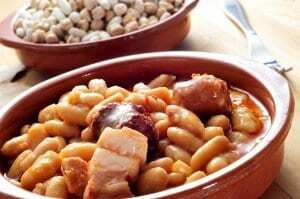 Indeed, beans are an essential element of Asturian gastronomy and there are many specially cultivated varieties. The best, and the most expensive are La Granja beans, which often cost far more than the local game and are probably the best in the world. They come into their own when chefs prepare the local dish Fabada, a savory stew combining pork and beans. Fat buttery beans are simmered with tocino (belly pork) morcilla (black sausage) smoky chorizo sausage and ham. It’s a wonderful introduction to Asturian culinary art; the beans take on the rich flavor of the meat, especially the tocino. This is perhaps the true face of ‘la cocina asturiana,’ which is defined by its heartiness and honesty, rather than technical prowess. However, more sophisticated Michelin restaurants are to be found in the region, but generally, locals prefer tried-and-tested culinary techniques rather than molecular gastronomy. Which incidentally, can be found in abundance in Cudillero. The seafront-facing square is full of seafood restaurants, some of them far better than others. Our favorite is Opera Cudillero (Plaza Marina), which serves traditional dishes in the most friendly and inviting of surroundings. Bar el Rincon de Berto is the place to go looking for seafood tapas, washed down with a glass (or few) of local cider. Speaking of cider, you’re in for a treat as Asturia’s is arguably the finest producer of fermented apple juice in Europe. It is always served in the traditional way: the cider is poured into the glass from a great height, the oxygen it acquires on the way down giving the drink an essential kick of freshness. Top producers include Tierra Astur and Los Pomare, although most restaurants will also have a good selection of wines, including Albariño from Galicia and Rioja. A truly captivating building, Cudillero’s church was rebuilt in the Gothic style, despite its 16th-century origins. It boasts a very beautiful single nave with a cross vault and a semicircular apse. During the Spanish Civil War, it was burned down and restyled in the bold Gothic mantra we see today. The village’s most famous monument, the Mirador de la Garita-Atalaya is an old lookout, reached by a winding stairwell at the top of the village. The reward is a spectacular view of the surrounding coastline. A university city and the cultural and commercial capital of Asturias, Oviedo is definitely worth a day-trip from Cudillero. In and around Oviedo are many pre-Romanesque buildings; the nucleus of the medieval city is the breathtaking Plaza Alfonso, bordered by a number of handsome old palaces. These spectacular mountains were supposedly christened the ‘Peaks of Europe’ by returning sailors for whom this was often the first site of their homeland. The range is today Europe’s biggest national park and easily accessible from Cudillero. Expect deep winding gores, verdant valleys and an astounding amount of flora and fauna.